Well, Portugal’s voters agree — or at least, they SAY they agree. On Sunday, they threw out the left-wing Socialist Party, headed by current Prime Minister José Sócrates, and threw in the center-right Social Democrat Party (PSD), according to AFP. “I want to guarantee to those who are watching us from abroad that Portugal does not intend to be a burden for the future to other countries that lent us the means that we needed today to face up to our responsibilities. The problem is that Passos Coelho cannot possibly do that. Yields (interest rates) on Portugal’s 10-year bonds have been rising steadily for a year, and are now close to 10%, indicating that investors increasingly believe that Portugal will default. Portuguese bond yields are not yet as high as the astronomical Greek bond yields, but they’re getting there, and there is nothing on the horizon that’s going to bring them down. It’s worth remembering at this point that fraud is the norm these days, and politicians lie openly and easily. 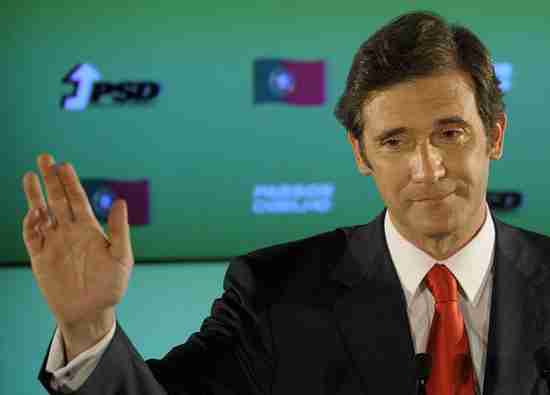 José Sócrates said for months that Portugal’s finances were sound, and that Portugal would never have to ask the EU for a bailout. And he kept saying that over and over again, until just before the moment when he announced that he was asking the EU for a bailout. That brings us to Greece, the country that lied its way into the eurozone by selling fraudulent synthetic securities manufactured by Goldman Sachs, but didn’t tell the EU auditors about them. Last year, Greece was granted a 110 billion euro bailout, and all the politicians promised that would be enough. However, a couple of weeks ago, it was disclosed that Greece would need another 60-70 billion euros of aid, according to MarketWatch. Well now an analysis by Der Spiegel shows that the new estimate of 60-70 billion euros is not nearly enough. Greece is going to need at least 100 billion euros more aid, according to the new estimate. Furthermore, it is still bitterly disputed whether private investors will be required to take a loss in this new aid package, or whether taxpayers will have to bear the entire burden. Some countries, especially Germany, are saying loudly that their taxpayers will bail out Greece unless private investors participate in the aid by losing some of the principal on the bonds they own. The European Central Bank (ECB) has been saying even more loudly that any private investor participation would be equivalent to a debt default, and would be devastating to banks across the eurozone, since many of them have Greek bonds in their vaults. “At a meeting of senior officials from the Euro-zone last Wednesday Germany’s Financial Secretary Jörg Asmussen rejected any new program put forth by the participants, if private investors didn’t make sacrifices as well, despite ECB demands. He stood alone against the rest of the euro zone. Asmussen indirectly threatened at the meeting to force Greece into bankruptcy. He made clear to his colleagues that without involvement of the private sector, there would be no approval by the Bundestag (German parliament) — and without that, there would be no new program. And without new help, Greece would soon face bankruptcy. Greece will have to agree to implement harsh austerity measures to get any bailout at all, but now Bloomberg is reporting that a backlash is developing against prime minister George Papandreou of Greece’s Socialist Party. Greek’s parliament is rebelling, and he may forced to step down, just as Portugal’s Sócrates was. There’s an old saying that “Once you understand the problem, you’re 90% of the way towards solving it.” Actually, that isn’t true. This problem is pretty well understood by now, but no solution exists. Just because you understand a problem doesn’t mean that a solution even exists, and that’s true in this case. I keep saying that history has been speeding up lately, and we’ve seen it again this weekend — in Yemen, in the Golan Heights, and in the deteriorating eurozone. It won’t be much longer now.